If you are running a busy help desk or customer service centre it would be easy to miss the high priority tickets in the mass of items coming through. With SharePoint Highlighter there is no need for that any more, as we can quickly and easily Highlight High Priority tickets as they come in. 1. 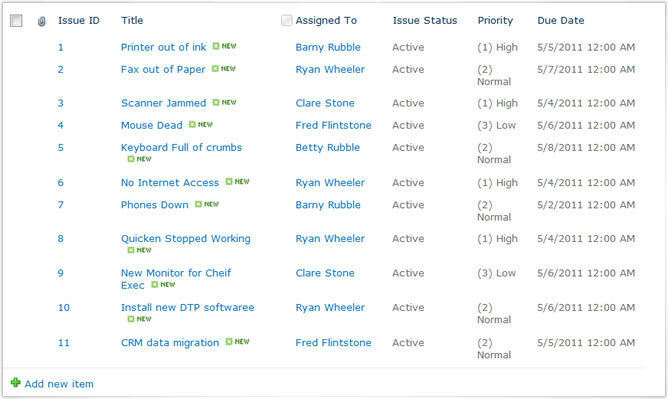 Create your list, for this example we are going to use an Issue Tracking List, as this is pretty much ideally set up for help desk tickets or customer service issues - though remember, Highlighter will work on any SharePoint list or Library. 3. 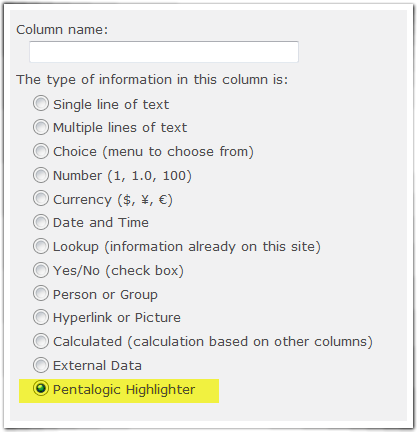 Choose "Pentalogic Highlighter" as the column type. 5. Now to set up how we want things to be displayed. We can go for icons, row or cell highlighting; in this case we are going for Row highlighting to make sure things really stand out. We're going to base the highlighting on the Priority column. 6. Now on to the rules. It's here that you get to format exactly how and when you want your Highlighting to appear. If you click Auto-create the default highlighting rules will be created. So if we leave things like this we are going to get our High Priority items highlighted in red, which is what we want, but also normal in yellow and low priority in green: It's going to turn in to a bit of an amazing Technicolor nightmare list I think! So let's edit these and calm things down a bit. 7. Delete the rules applying to Normal and Low priority items, by clicking the red minus to the left of the rules we don't want. Then to change the color, simply by click on the color block in the rule and choose a better color from the color picker. 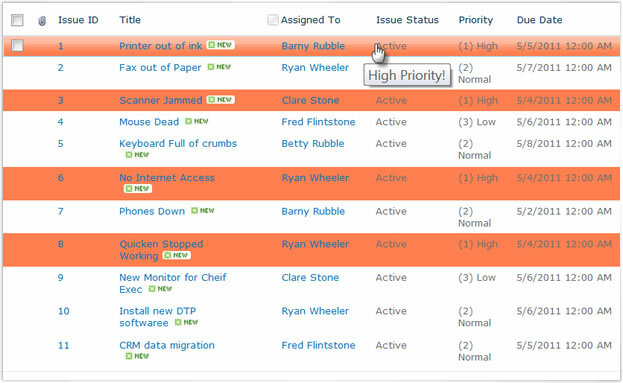 It's now easy to pick out the High Priority list items which need special attention, at a glance.